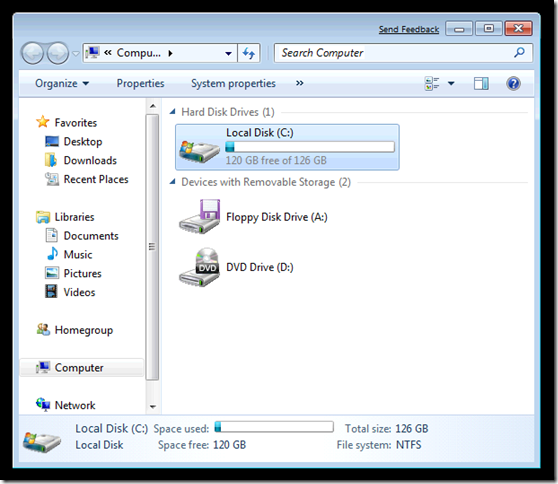 If you are attempting to run Windows 7 in a virtual machine, do not install Virtual Machine Additions or you will get to find out what the Windows 7 System Restore Utility can do for you. At least do not install virtual machine additions until you update your virtual machine additions appropriately. If you are running Virtual Server like I am, this mean you just need to update your Microsoft Virtual Server R2 SP1 to the Virtual Server R2 SP1 Update. Then try installing the virtual machine additions and see what happens. With respect to Windows 7, I am really surprised at how fast the installation completed. I went through a complete installation in less than 30 minutes. That counts the time from putting a DVD into a computer to using Windows. Microsoft gets a good rating there! 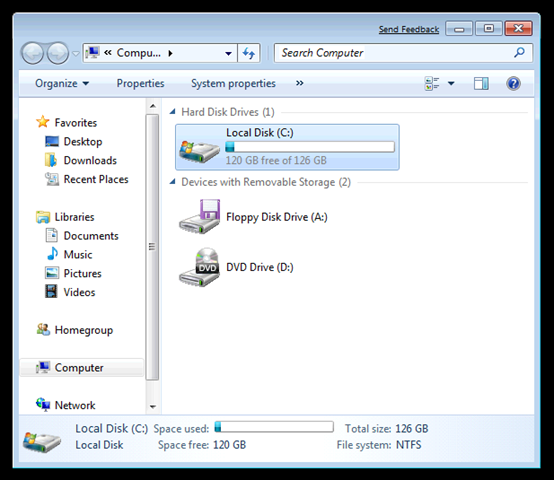 The installation footprint is about 6GB of Hard Drive space for Windows 7 Ultimate. That may seem like more than other operating systems, but remember that hard drive space keeps getting cheaper. Next thing I noticed was how little memory (RAM) is required compared to Windows Vista. I am running Win7 Ultimate smoothly in a VM with 800MB of RAM. 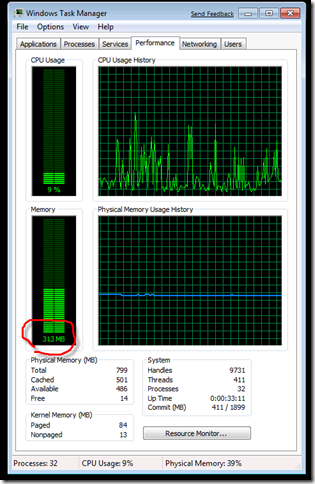 The default Win7 memory usage is just over 300MB when idle. That can be tweaked down by shutting down unnecessary services. 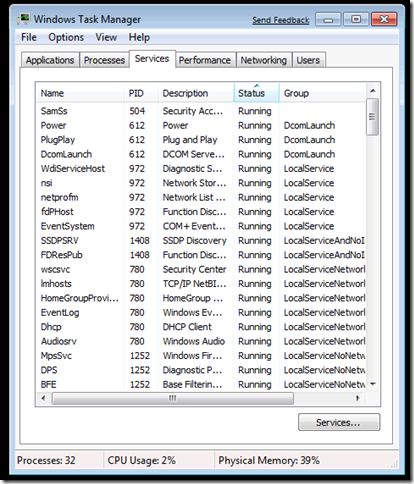 Speaking of services, I really like the new services tab that lets me configure services right in the task manager. 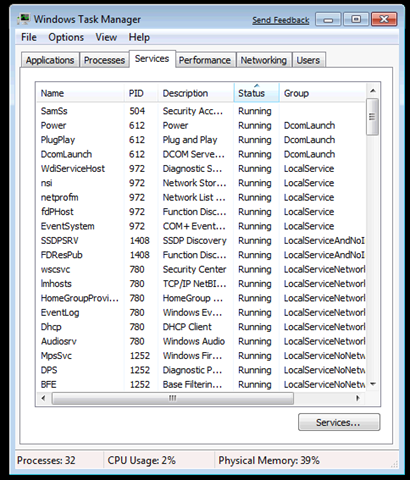 Does anyone else find it humorous that Windows knows it's running inside of a virtual machine?! 313MB of RAM, that might actually be at or less than xp. I give M$ two thumbs up on that for taking out all the unessicary junk in the os (as that looks like they did). When installed in hyper-V, the virtual machines additions were automatically installed during the OS installation process ("checking for updates..." if I recall correctly), which is great because my hyper-v host does not have keyboard/mouse/monitor and it is normally a tricky pain-in-the-arse to get them installed over remote desktop connections. However, I found the installation time to be the same as Vista and Server 2008 (which, of course, is much better than XP). This happens with Windows 7 RC too. We solved an ussue with windows 7 and Virtual Server 2005.
also happens with Windows 7 RTM. which directs me to VPC2007SP1.